Opportunity - a time or set of circumstances that makes it possible to do something. How many times have you had opportunity knock on the door and you haven't let it in? I have, and sometimes it has kept knocking and knocking and I still haven't let it in. But for whatever reason, you just wont answer it and let it in. Eventually though, you get the message that maybe those "opportunistic" moments are presenting for a reason and maybe you need to take notice and open the door. One of my favourite movies is Yes Man where the main character takes on the challenge of saying YES to everything and I mean everything, and with that brings great adventure and positive change in his life as he overcomes his fear of the unknown. Sure it's a hollywood blockbuster, but the message is very clear - SAY YES TO OPPORTUNITY WHEN IT PRESENTS, even if you feel scared. Over the past 6 months since I was made redundant, I have been open to all opportunities. I even saw being made redundant as an opportunity to consider what else might arise here in Melbourne and I guess the biggest thing it did was give me time to think about what I want next in my life. I used my time to do some personal development, get some life coaching and see where my strengths are and how I can use them to my advantage. I tapped into a lot of free events that I found on facebook and meetup and went along to see what I could glean. One of the great things I did was attend a free public speaking course. It was amazing to learn in really simple steps how to get up and talk in front of a group. At the end of the night I volunteered to get up and do a 2 minute impromptu speech to about 30 people. I talked about finding purpose and how I wanted to pursue some things that would satisfy me in a personal and professional way. I talked off the cuff and felt an incredible sense of achievement from this. Was it uncomfortable - Yes, was it worth it - hell yes. But I saw an opportunity and I took it. Work opportunities have been less forthcoming, so I have had to think about my longer term plan. Maybe my opportunities aren't here in Melbourne, as I have found that securing ongoing work hasn't happened and the financial impact has been devastating. I LOVE LOVE LOVE Melbourne, but I need to take notice of the resistance that is surrounding me. I have found that the more I have tried to lock down my future here, the less it seems probable. Six months is a long time to hold on for maybe, so I am listening to this loud and clear and taking notice of the blockers. There's a big world out there and maybe I am meant to be out there amongst it. When you apply for over 100 jobs and get only a handful of interviews, then you have to wonder if there's a bigger plan ahead, right? And with that, I need to act. In my last post, I talked about meeting a lovely man and as we have spent time together we have both agreed that maybe our opportunities are elsewhere and with that I have joyfully accepted this and set the motion of change in effect. I have given notice on my place and begun to downsize my possessions so I can travel lighter. I have a lot of stuff and I don't want anything to hold me back. I already paid for most of it to be in storage for the past 3 years at a staggering cost of nearly $5000, so I am prepared to give it all away if need be, because as much as I love these items, I don't love them enough to pay to keep them locked in a warehouse gathering dust. My "One Day" is here and I am freeing myself of all this baggage. I hate to think I am living in a throwaway society, but I have to take charge of my life and be realistic about circumstances and things need to change. I started to unpack everything I got out of storage and it turned into a garage sale. I literally opened my garage door and put some stuff out to sell. How's that for opportunity. 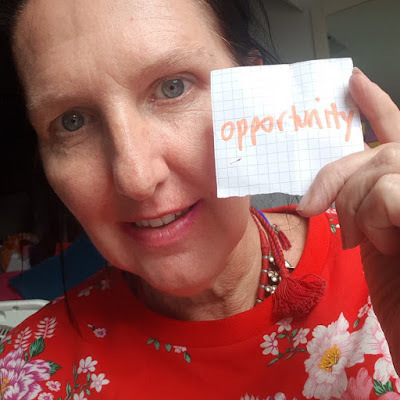 So what else can I share about opportunity? If something keeps nagging away at you, then maybe it's opportunity trying to get your attention? Listen to it! My ex husband kept nagging away at me and eventually I listened and I realised that the opportunity to live a happy peaceful life was passing me by. If an opportunity arises, take it, jump on it, embrace it. You may welcome it wholeheartedly, or you may not think it is right for you or has any benefit, but you'd be surprised what doors open up just by saying "yes". Whether it's opportunity to further your career, go on a date, get up and speak in front of strangers, take a road-trip, whatever it may be, JUST DO IT. Use it to broaden your world and your life experiences. You can always change your mind if it isn't working, but the opportunity may not present again, and you don't want to live with regret. Embrace fear. Make it your friend and let it guide you to bigger and better things. The comfort zone is a great space if you want to live in comfort, but being out of your comfort zone is where our magical moments happen. The more uncomfortable we are, the greater opportunity it gives us to grow our confidence and abilities and to enjoy our life. Over three years ago I said yes to moving to Melbourne. It was an opportunity that I didn't want to regret pursuing, so I took it. It's been a great adventure, but maybe its purpose has been fulfilled. In fact, I know some things have. I always wanted to live here. It has enabled me an incredible amount of self-growth. I have made some amazing friends who have stood by me along this journey. I found my voice and I like it. I feel empowered, confident and strong and that my not have happened had I stayed in my safe space. I have also met the lovely man and had my heart healed. However our journey turns out, I know that the care and kindness I have experienced in the short time I have known him is something I have never experienced before and it is an absolute joy to have had that unexpected opportunity. My bigger picture is now to move to Canberra, pursue some contract work there, get myself back on top financially and then see what opportunities present and I will be doing this with my new found love beside me. Opportunity awaits and I am ready for it. See you soon for the next word that I pull out of my lucky dip. I can't wait to see what it is.